304 pages | 18 B/W Illus. 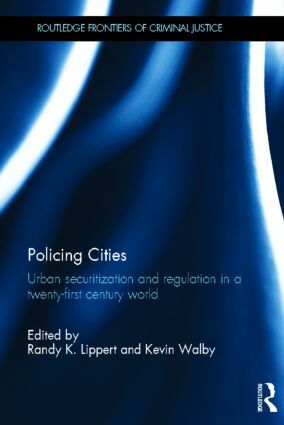 Policing Cities brings together international scholars from numerous disciplines to examine urban policing, securitization, and regulation in nine countries and the conceptual issues these practices raise. Chapters cover many of the world’s major cities, including New York, Beijing, Paris, London, Berlin, Mexico City, Johannesburg, Rio de Janeiro, Boston, Melbourne, and Toronto, as well as other urban areas in Britain, United States, South Africa, Germany, Australia and Georgia. This collection will have a wide readership among upper level undergraduate and graduate level students in several disciplines and countries and can be used in geography/urban studies, legal and socio-legal studies, sociology, anthropology, political science, and criminology courses. This work provides an important contribution to the academic study of criminology, policing and urban security in the 21st century. The authors are respected contributors in their field and their insights will assist both undergraduate and postgraduate students to inform and develop their own perspectives on a number of key criminological issues. Foreword, The Complexity of Urban Law, Nicholas Blomley, Introduction: How the World’s Cities are Policed, Regulated, and Securitized, Randy K. Lippert and Kevin Walby, Part 1: Public Police Reform and Community Policing in 21st Century Cities, 1. Policing Urban Insecurities through Visible Patrols: Managing Public Expectations in Times of Fiscal Restraint, Anna Barker and Adam Crawford, 2.From Revolution to Government, From Contradictions to Harmony: Urban Community Policing in Post-Deng China, Gary Sigley 3. To Know the City: Urban Policing Innovations in the Post-Soviet Republic of Georgia, Matthew Light 4. Policing-Centered Community Cohesion in Two British Cities, Don Mitchell, Kafui Attoh, and Lynn A. Staeheli Part 2: New Modes of Urban Policing and Governance, 5. Zonal Banning and Public Order in Urban Australia, Ian Warren and Darren Palmer, 6. Polychrome Policing in German Cities: Extending the State’s Monopoly on the Use of Force, Volker Eick, 7. Rescaling Security Strategies: State Tactics and Citizen Responses to Violence in Mexico City, Diane E. Davis and Guillermo Ruiz de Teresa Mariscal, 8. Legal Tails: Policing American Cities through Animals, Irus Braverman, Part 3: Policing City Spaces and Regulating Conduct, 9. Reconfiguring Urban Britain: Policing, Spatial Justice and Postmodern (In) security, John Flint, 10. Governing Security in Public Spaces: Urban Improvement Districts in South Africa, Julie Berg 11.Get lost! The Impact of Punitive Policy on Homeless People’s Life Chances in Berlin, Jürgen von Mahs, 12. Contentious Policing in Paris: The Confrontation between Two Public Orders, Virginie Milliot and Stéphane Tonnelat, Part 4: Securitization of 21st Century Cities 13. A New Military Urbanism? Risk Mitigation and Municipal Corporate Security in Canadian Cities, Kevin Walby and Randy K. Lippert, 14. Securitization Strategies: Gated Communities and Market Rate Co-ops in New York, Setha Low 15. Urban Securitization in Mexico City: a New Public Order?, Nelson Arteaga Botello 16. Pretext Securitization of Boston’s public realm after 9/11: Motives, actors and a role for planners, Susan Silberberg. Randy K. Lippert is Professor of Criminology at the University of Windsor, Canada specializing in security, governance, and policing. He is co-editor of two other Routledge publications, Eyes Everywhere: the Global Growth of Camera Surveillance (2012) and Sanctuary Practices in International Perspective (2013) as well as author of Sanctuary, Sovereignty, Sacrifice (UBC Press, 2006). Kevin Walby is Assistant Professor of Sociology at the University of Victoria, Canada specializing in surveillance and policing. Hehas authored or co-authored articles in Policing and Society, British Journal of Criminology, Criminology and Criminal Justice, Punishment and Society, Social and Legal Studies, International Sociology, and Current Sociology. He is the Prisoners’ Struggles editor for the Journal of Prisoners on Prisons and co-editor of Brokering Access: Power, Politics, and Freedom of Information Process in Canada with M. Larsen (UBC Press, 2012).